Styrofoam, newspaper, wire, ornament hook, paper mache/clay, glitter. To see all of the reader-submitted items, including more from Sharon, visit our Practical Paper Mache page. I love these! The retro-yellow-guy especially appeals to me. I am so inspired!! Thank you, I used your techniques described in your book to build the framework for my cats. They came along so much quicker using your techniques. Yes, of course you can include the ornament instructions in the ebook. Thank you so much for the information about using string and other texture to make such a lovely design on the the glittering Christmas Ball. I must try to make one or two. You are welcome June. 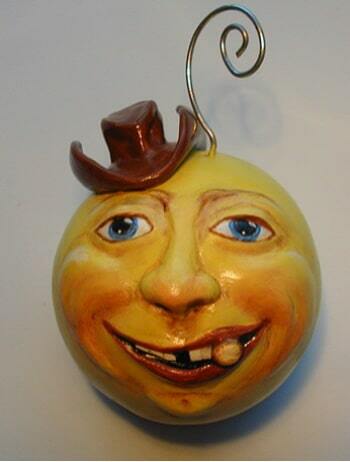 I’d love to see your ornaments when you finish them. Now I want to create some more! I’m sorry, I’ve been so busy mache ing away, attempting to get something finished for my etsy shop I haven’t even looked at the computer. ( if it’s okay to leave my etsy info here Jonni I’ll add it at the end of this comment post. There are a couple of sold ornaments in that section). June, I tried your idea with the glue gun but I found I couldn’t get a smooth even consistent line out of it so I scrapped that idea. The only thing I had to buy is the the glitter – I had everything else on hand. The materials I used: styrofoam balls ~ wire ~ Jonni’s paper mache and gesso recipes ~ lots and lots of sandpaper ~ cotton packaging string ~ paper mache clay for the fine details ~ and glue. know I think of these things after the fact. 3. cover entire ball with paper mache recipe. Dry thoroughly. 5. use sketch to draw your design on the ball. stores (I didn’t think of it until now). 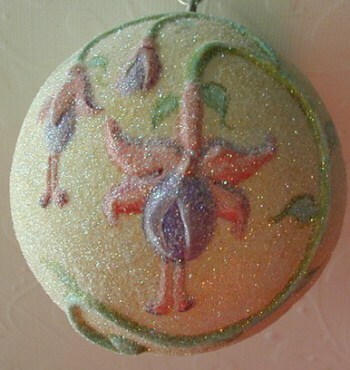 7. then sculpt the flowers and glue the string onto your design you drew onto the ball. 10. paint, varnish and while still tacky apply glitter. Thanks, Sharon – this is great. (and that cat on your Etsy shop is really quite intriguing – I hope everyone takes a look). May I add these instructions to the Christmas ball page in our ebook? Joni, all the mache projects are unique and interesting..
sharon, your mache is exceptional. 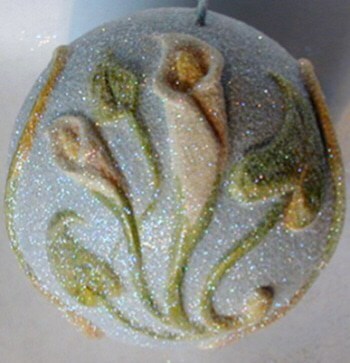 How do you get the texture on your Christmas balls..the flowing stems of the flowers and the flowers themselves. I was just thinking of adding a textured line using hot glue and pulling the glue in the direction I wanted, then cover with mache. Has anyone done that? Love all the ideas. Such an inspiration.